Dancers clad in animal skins opened a royal ceremony today, a nod to tradition for the forward-thinking kings, queens and chiefs who jetted in to Johannesburg from across Africa to launch an institute they hope will expand their roles on the continent. King Tchiffi Zie Jean Gervais of Ivory Coast leaves after the launch of the Institute of African Royalty in Johannesburg, South Africa. 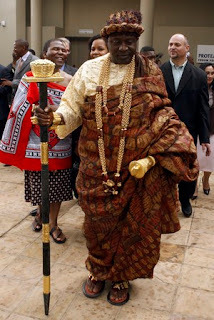 Twenty-four traditional leaders from across the continent gathered on a Johannesburg university campus to launch the Institute of African Royalty, which they say will be a combination of think tank and lobby group. The two dozen leaders from Morocco to Swaziland describe their new Institute of African Royalty as part think-tank on democracy and development, part lobby group to polish their image. They say their model is anti-apartheid icon and former President Nelson Mandela, and plan to honor the man referred to during Tuesday's proceedings as "Prince Mandela" at a gala ceremony in Pretoria, the capital, later this week. Sello Hatang, a spokesman for the anti-apartheid icon's office, said Mandela "feels honored to be respected by the traditional leadership." "My later notions of leadership were profoundly influenced by observing the regent and his court," Mandela wrote in his autobiography, describing meetings called to discuss community matters such as coping with droughts, managing cattle and responding to new laws decreed by the colonial government. "Everyone who wanted to speak did so. It was democracy in its purest form." But as a young man, Mandela fled rural southeastern South Africa for Johannesburg to avoid a marriage arranged by the regent. During the apartheid years, Mandela clashed with his nephew, K.D.Matanzima. Matanzima collaborated with the white government to lead one of the homelands set up to deny blacks citizenship, and then ruled it like a despot. Daniel Masombuka, a 36-year-old city counselor who arrived today in the entourage of his relative, the Ndbele King Makhosonke II, said the spirit of listening and finding consensus that Mandela saw in the tribal meetings of his youth needed to be revived. But Swazi King Mswati III, represented by a brother, holds most of the power in his southern African nation of just over 1 million people, resisting calls for greater democracy.